WEST HARTFORD — Friends and supporters of Jewish Family Services gathered at the West Hartford-based social service agency recently to celebrate the rededication of its kosher food pantry in honor of Anja Rosenberg, a tireless champion of food programs in the Greater Hartford community, including the food pantry at JFS. Rosenberg and her husband, Gene, have been extremely generous donors and stalwart supporters of JFS and its programs, said Michelle Souza, director of marketing and development. Anja serves on the JFS board as first vice president. 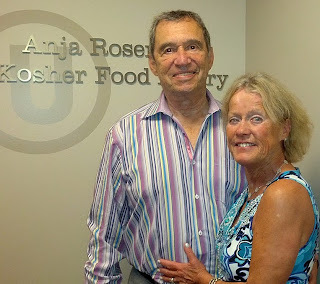 Gene Rosenberg took advantage of a family naming opportunity at JFS to honor his wife’s hard work in the community, and as a gift for her birthday, Souza said. During the dedication ceremony, JFS Executive Director Anne Danaher praised Anja Rosenberg’s sensitivity and empathy. Anja Rosenberg, pictured with her husband, Gene. In addition to her work at JFS, Anja Rosenberg has helped prepare and serve an estimated 44,000 meals at House of Bread in Hartford, her husband said. Anja also is a long-time volunteer with the Hebrew HealthCare Auxiliary and reads to children as part of her work with Jewish Literacy Program. JFS has the only kosher food pantry in the Greater Hartford community and offers non-perishable food items, toiletries, cleaning supplies, bread, eggs, and fresh produce to clients in 18 towns. Demand for services has more than tripled in ten years. In the first three months of 2013, the pantry distributed an average of 286 bags of groceries a month to a total of 343 families, Souza said. For more information about this event and JFS programs contact Michelle Souza at (860) 761-7082 or by email: msouza@jfshartford.org. Jewish Family Services of Greater Hartford is a 100 year old social service agency helping individuals and families deal with life cycle transitions and adversity. Guided by the highest professional standard in counseling, advocacy and educational programming, the agency seeks to enhance and strengthen quality of life for all those in need through the Jewish tradition of caring and compassion. The JFS staff of licensed clinical social workers, with an average of 15 years of experience, has the training, credentialing, and expertise to identify and deliver the compassionate services each client needs. Jewish Family Services of Greater Hartford is licensed by The CT Department of Children and Families, and accredited by The Council on Accreditation (COA). Founded in 1977, COA is an independent not-for-profit international accreditor of the full continuum of community-based behavioral health care and human service organizations. To learn more, visit our website at http://www.jfshartford.org.